Bring the essence of a rolling river into your bath. Flagship whirlpools offer unique features and benefits these luxury whirlpools offer special, innovative enhancements to provide a multitude of water experiences, from soothing relaxation to invigorating massage. Whirlpool, rapids and whitewater river experiences at the touch of a button. Featuring two variable-speed pumps with 18-settings and 4-kW, in-line heater. Chromatherapy lighting, eight Flexjet(TM) whirlpool jets and four Riverjets(TM) provide direct hydro-massage. Bring dramatic design and functional elegance to the bath or powder room with this ProFlex(R) corner bath. This 54 in. model offers maximum comfort with space-saving dimensions. Constructed of high-quality acrylic for durability and luster, the bath features an integral tile flange to prevent behind-the-wall water damage, and is available in a palette of KOHLER colours to complement any dicor. Also available in store by special order only see store for details. 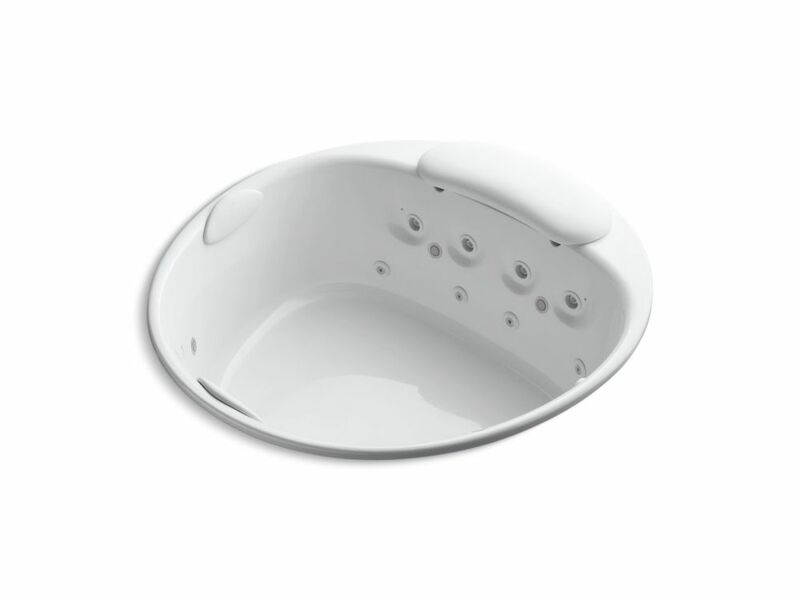 River bath Round 5.5 ft. Whirlpool Tub In White The natural rhythm of water can be found in the hypnotic cascade of a waterfall, a tranquil brook, and the exhilarating rush of rapids. The RiverBath whirlpool brings home these natural sounds and rhythms combined with mood-enhancing colour light therapy. Rapids, whitewater, and whirlpool settings offer a full range of water massage treatments at the touch of a button--in a spacious bath sized for multiple bathers. River bath Round 5.5 ft. Whirlpool Tub In White is rated 5.0 out of 5 by 1. Rated 5 out of 5 by ilovehomedepot2121 from Best thing ever!!!!!!!!!!!!!!!! I have waited for this to come out for my WHOLE LIFE!!!!!!!!!!!!!!!!!!!! I love it soooooooooooooooo much. Even my hubby wants to use it. It is sooooooo cool!!!!!!!!!!!! !